The Malta Human Rights Report 2013 provides an overview of the major developments relating to human rights in Malta over the past year. The year 2013 was marked by the threatened push back of sub-Saharan migrants to Libya which was halted by the European Court of Human Rights, the MV Salamis incident of rescue at sea and the legal issues this stirred up, and the European Court of Human Rights’ decisions regarding Malta’s detention policy. Although this publication focuses on developments in the year 2013, and is written to reflect the socio-political climate present in this time-period, it should be noted that many of the issues identified throughout the report were, and remain, ongoing. The report explores thematic issues such as maritime migration, migrant detention, racism, integration, access to citizenship, trafficking, and children’s rights, amongst others. It incorporates developments that have taken place at the National and a European level, both of which come to bear upon the way in which human rights are effectively realized and experienced in Malta. In the field of immigration, this report highlights the importance of Malta’s international non-refoulement obligations, particularly with respect to the threatened push backs to Libya in July 2013, and the MV Salamis incident in August 2013. Two Constitutional Court decisions on the issue are also elaborated in the report. Malta’s policy of mandatory and automatic detention continued to be criticized from various quarters over the course of 2013, most notably in two separate European Court of Human Rights judgements, as well as reports by international human rights bodies including the Universal Periodic Review and the European Commission Against Racism and Related Intolerance. The Malta Human Rights Report 2013 also takes account of efforts and challenges in the integration of minority groups. There was a notable increase in the level of hate speech in 2013, fuelling already-persistent discrimination and further hindering integration efforts for migrants who reside in Malta. Significant efforts were made over the course of the year in the area of human trafficking, through the implementation of the national action plan as well as non-governmental initiatives. The vulnerability of children to trafficking was specifically highlighted whilst the Committee on the Rights of the Child and the Office of the Commissioner for Children both made recommendations for better realization of children’s rights in Malta. The Malta Human Rights Update is a new initiative of The People for Change Foundation. It aims to provide a snapshot of some of the most pertinent developments in the field of human rights in Malta, particularly those which are of direct relevance to the work undertaken by The People for Change Foundation. As a result, the report largely focuses on issues of migration and racism, as well as children’s rights. 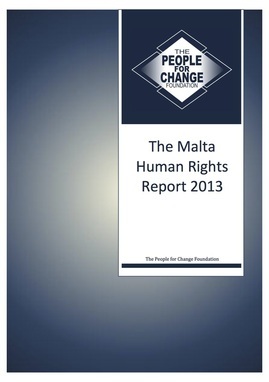 The Malta Human Rights Report 2013 is the first of its kind for the country, and will be an annual initiative undertaken by the People for Change Foundation. Beyond the documentation of human rights issues, however, the report seeks to engage with the underlying causal factors, and to engage with the legal, policy and social mechanism that would prevent and redress these issues. Download the press release from our Press Page.